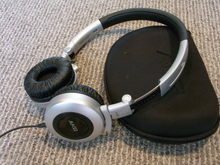 The latest pair of headphones to grace my desk are the delightful AKG 430s. This is a relatively new brand to the market, but seeing as these ‘phones are backed by Harmon Kardon of in car sound stereo fame, you could generally guess that creating high quality sound would be an important aspect to these. And the verdict? Read on to find out. You’re looking at a perfectly respectable pair of headphone, styled in matte silver and black. There’s a large rubberized band that sits comfortably across the head and the they can be adjusted to adapt to different head sizes. The cord comes with a volume slide controller attached which works very efficiently, and the two faux leather ear pad covers are very comfortable and rest well on the ears, rather than around them. 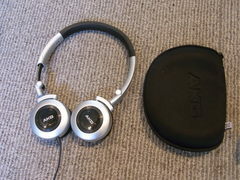 They can also fold up as well, with the earpads bending in towards the headband due to the unusual inclusion of some extra joints on the frame.The headphones come with a travel case as well, but they lose points here as the case is rather cheap looking and fiddly to open. The headphones are iPhone compatible and work equally well when plugged into a Sony MP3 player. They come with a 6.3mm jack adapter for stereo usage so you can hook them up to your stereo, and the volume controls on the device work amazingly, whichever option you choose. The AKG 430s provide you with perfectly decent sound quality. True, you can get crisper bass and a more dynamic range if you trade up a notch, but considering the pricing and the ease of use, these headphones offer really great sound. The headphones have a 125dB frequency range which gives you a nice selection of sounds and the closed back design allows you to filter out unwanted background noise. Whilst in no way am I suggesting these are sound cancelling headphones, they do offer you some of the benefits expected with larger ear pads, as the tight fitting band makes sure that you’re able to concentrate on your tunes without too much ambient distraction. 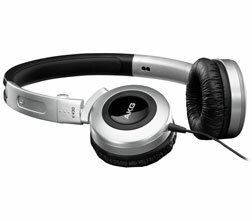 The AKG 430 offers you the comfort of a luxury looking set of ‘phone at a decidedly budget price. I love the way they’ve taken the time to fit the set with extra touches like a gold plated 3.5mm jack and extremely comfortable ear pads, and the foldable design is extremely handy for on the move audio fiends. The range of frequencies lets it down slightly as does the nasty carrying case, but overall you’re looking at a decent pair of headphones that are attractively priced. 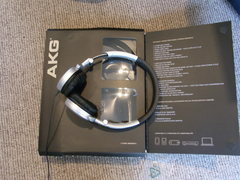 Check them out on AKG here and get them for around £34.99 here. And ‘The headphones have a 125dB frequency range which gives you a nice selection of sounds’, I hope you do realize that 125dB is the SENSITIVITY of these headphones and has very little to do with the frequency range, which is expressed in Hertz (12Hz-28KHz for these headphones). Please, write a good review or don’t write one at all.